Need help getting started with your lighting design? Check out some of these great resources we have gathered from our manufacturers, the American Lighting Association, and other online sources to help you learn more about what makes great lighting design and—more importantly—what will make the right lighting design for you. For help selecting the right type of lighting for each room in your home, visit “Choosing the Right Lighting” courtesy of Capital Lighting. Also refer to “Lighting Your Home”, an excellent guide put together by the American Lighting Association. For an introduction to key lighting design concepts, refer to “Basic Lighting Strategies” courtesy of Lightsearch.com. See also their guide for lighting kitchens, bathrooms, and living spaces (such as a family room or bedroom). 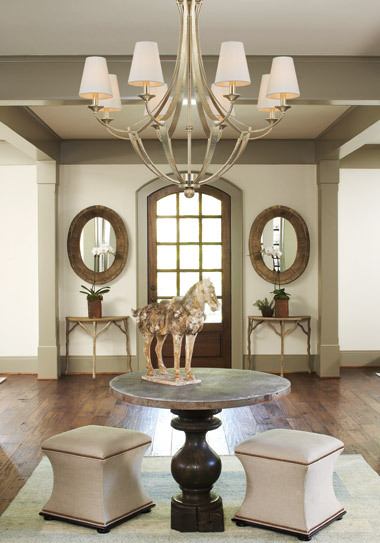 For expert recommendations on lighting design and light positioning, visit “Designer Tips” from Uttermost. Also, don’t miss their “Great Lamps” guide for table and floor lamps. To learn more about the different lighting styles, visit “Style Guide” by Kichler Lighting. For an excellent guide to proper lighting for the aging eye, see “Lighting Your Way to Better Vision” courtesy of the Illuminating Engineering Society in cooperation with the American Optometric Society.